Gaming peripheral manufacturers have focussed on RGB illumination in recent years but the trend for 2018 is to cut the cord and go wireless. We've already seen good examples in the form of the HyperX Cloud Flight headset and Corsair K63 keyboard, and today we turn our attention to another wireless solution; the Corsair Dark Core RGB SE gaming mouse. 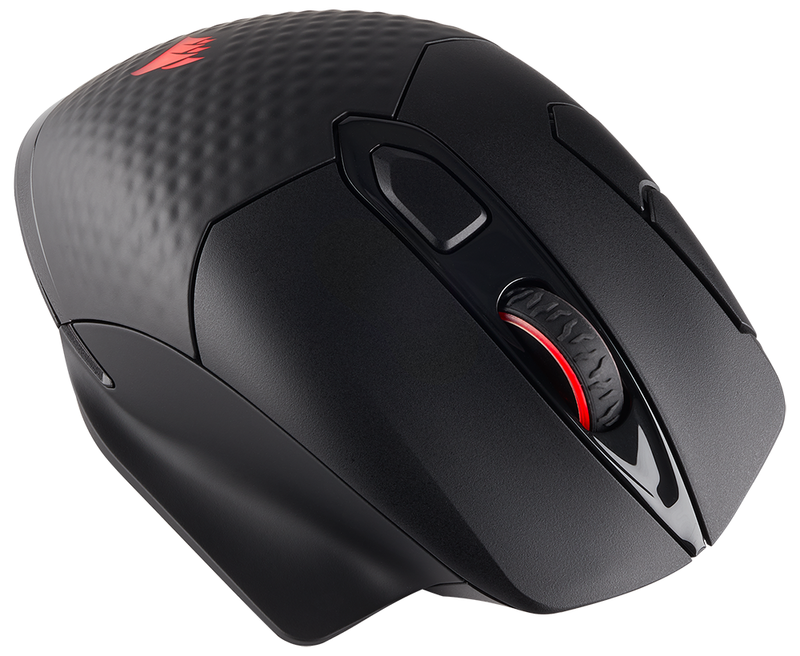 Priced at £100 and considered to be an ideal companion for the K63, Dark Core RGB SE adopts the same approach to connectivity by offering a versatile choice of 2.4GHz Wireless, Bluetooth or wired operation. Covering all bases, the 2.4GHz connection boasts a 1ms response time that should meet the needs of even the most demanding gamers, Bluetooth is less responsive (7.5ms) but useful for moving between host devices, and a wired link via the bundled 1.8m braided USB cable is always a handy backup to have. Improvements in wireless connectivity are such that most users will be hard pushed to tell the difference - there's no discernible lag to our eyes - but Dark Core RGB SE offers the best of both worlds. Want to keep cable clutter at bay? Go wireless. Need to ensure there's no outside interference during tournament play? Attach the cord. The one potential drawback to wireless operation is battery life. 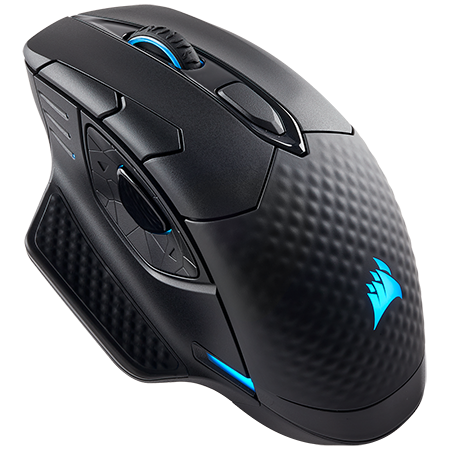 Corsair equips the mouse with a 950mAh rechargeable lithium-polymer battery that is good for 16 hours of gameplay, and this can be extended to 24 hours by enabling a power-saving mode that disables the onboard RGB LEDs. The mouse can be recharged via USB, but the Special Edition sauce on this particular model is the addition of Qi wireless charging that links neatly with Corsair's new MM1000 mouse pad - more on that later. If you don't anticipate purchasing the mouse pad, or you don't feel the need for wireless charging, a regular Dark Core RGB without Qi support is available for £85, representing a £15 saving. 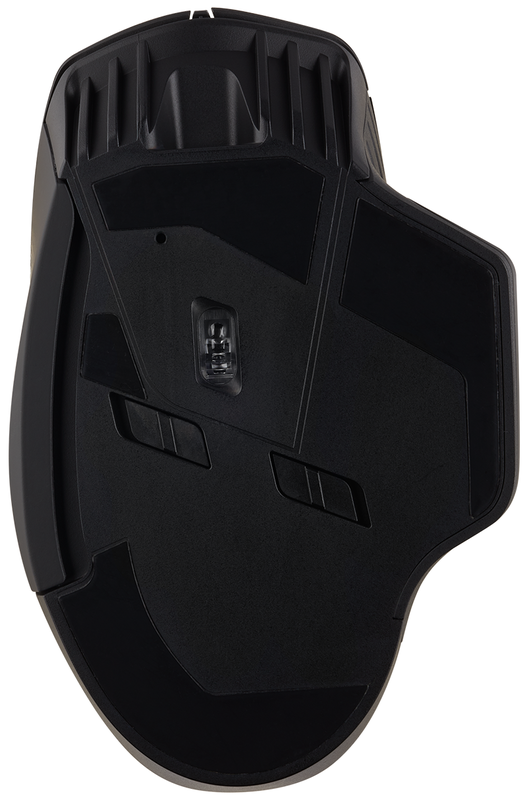 All the talk tends to revolve around the product's wireless capabilities, but let's not forget that there's a highly capable mouse at the heart of it all. Corsair's 127mm x 83mm x 43mm profile is well suited to my larger-than-average hands, and the 128g weight feels about right, which is fortunate seeing as there's neither height nor weight adjustment to speak of. I find the form factor better suited to a palm grip, as opposed to claw, and I'm quite liking the ribbed, rubber-like texture of the palm and thumb rests, which provide good grip without feeling at all sticky. Should you prefer to have a resting place for your pinky, you'll appreciate the choice of two side grips; one flat, the other acting as a secondary wing. There are nine programmable buttons in total, but in use they aren't all easily accessible. The frontmost button of the three on the left side always feels like it's out of reach of my thumb, though the central button is easy to find as a sniper switch. Two buttons integrated into the left-clicker require a bit of dexterity but respond well, and behind the clickable scroll wheel is a useful sensitivity toggle button that by default switches between 800, 1,500 and 3,000 DPI presets. The wheel itself is textured for extra grip and lightly notched for precision, but is a tad noisy during rapid scrolling. As the name suggests, RGB lighting is in plentiful supply. Corsair has the illumination split into three zones - the Sails logo, the scroll wheel and a few elements on the left side - and each can be independently customised with a wide range of colours and effects using the familiar CUE software utility. The same app is used to remap buttons or record macros, and the mouse has built-in memory supporting three on-board profiles, making it easy to take your customisations with you. Worth noting, also, that the lights aren't entirely superfluous as the LEDs on the left indicate charge status when the mouse is powered up. Three green lights represent a full charge, medium is blinking amber and pulsing red means you're on the brink. Dark Core RGB SE ticks most of the right boxes from a features perspective, however aesthetics are an acquired taste. The overall design is a tad too busy for our liking, and there are plenty of nooks and crannies for dirt to gather over time. The mouse feels good in the hand, but if you're hoping to make a statement, it doesn't quite look like a £100 piece of kit.